Today, online training of apprenticeship programs can take place from anywhere in the world, making these online courses extremely convenient for students. By removing geographical restrictions, any aspiring graduate can enroll in an online apprenticeship program. The goal of these programs is to produce better equipped graduates in their chosen field. Read on to take a look at what programs are currently available and whether or not they create a more informed, educated and employer-worthy graduate. How does an Online Apprenticeship Program Work? Whether a student is just graduating from high school or wants to further their knowledge in their chosen career, they can enroll in an online apprenticeship program to meet these goals. The programs are designed to instruct students with educational material as well as on-the-job-training under a professional in the chosen industry. There are many benefits associated with enrolling in an eLearning solutions apprenticeship program. One of the most attractive benefits is the reduced cost of training. Whereas traditional programs require expenses such as travel and accomodation, these expenses are eradicated with an online program. An apprenticeship program delivered online gives the student a broad range of learning resources that include interactive scenarios, task tutorials, skill-based simulations, and more. Training time is also reduced by an online apprenticeship program. This means that the student does not have to follow a strict schedule like they would with a traditional program. Instead, they work at their own pace, which can be as quick as they want. When designing an online apprenticeship program, it is important to consider the human element in the design. Online programs, in general, typically lack the presence of other students and the instructor. However, there are some simple ways to give an apprenticeship online course a human element aside from the on-the-job-training aspect. One way to do this is to think about how the course would be delivered face-to-face and try to include this type of “presence” when planning out the course. The instructor can use synchronous tools or audio tools that offer interaction among students and the instructor. UAW-Ford offers a perfect example of the benefits offered by online apprenticeship programs. In 2016, this company experienced a shortage of skilled laborers in several disciplines due to a large number of journeymen retiring. To help develop a new pipeline of qualified and trained candidates, the company developed a partnership with Penn Foster and created a custom training curriculum for students called the UAW-Ford’s Industrial Readiness Certificate Program. Now, more than 5,000 employees have enrolled in this program and it has an 86 percent satisfaction rating. Include stakeholders in the process: For example, stakeholders and partners can include community colleges, local governments, and industry groups. Include flexibility: An apprenticeship program should be designed to address the company’s specific needs as well as the needs of the surrounding community. 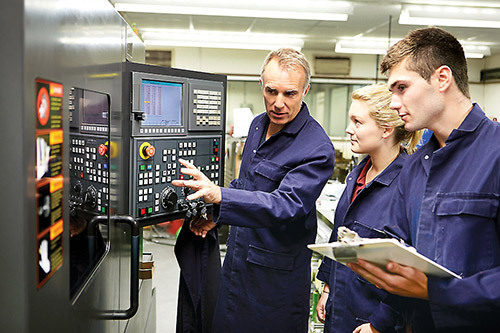 Highlight the Benefits: Organizations needs to see the benefits of an apprenticeship program and how these benefits include a return on their investment. Where are Online Apprenticeship Programs Headed? As technology and the way we communicate continues to rapidly evolve, apprenticeship programs are taking advantage of this. Some of the programs are going mobile, while others are pairing learners with online mentors and using realistic scenarios to educate the student in their chosen field. Does an online Apprenticeship Program Produce a More Educated Employee? The answer is yes. These programs produce highly skilled graduates that meet the needs of the employer. This makes it easier for the employer to narrow down their hiring selection and reduce recruitment costs. For the graduate, their increased knowledge gained through an apprenticeship program makes them more competitive in the job market. Employers will look favorably on a student who has successfully completed an online apprenticeship program because they know that the graduate comes with the necessary credentials and expertise to carry out the job. Also, those who have completed this program can expect to see, in most cases, better pay and benefits for the education they have received.